Just like A. Le Coq, Olvi and its subsidiaries have been in the business of making beverages for centuries – and we have always adopted a responsible approach to our operations. We care about the environment, we care about our workers and we care about society. Responsible practices have always been, and will always be, part of our corporate culture. Responsibility is one of the key values in Olvi group companies and a crucial component of strategic and everyday decision-making. 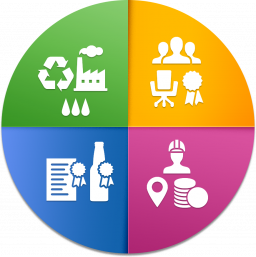 We think about how we can lead our companies and the beverage industry as a whole towards more corporate responsibility on a daily basis. To this end, we make responsible choices ourselves and help our partners and consumers do the same. But how does our sense of responsibility manifest itself? In addition to these focus areas, one of the cornerstones of our operations is ethical business. We both respect and pursue ethical business within the group, focussing our attention on it in all areas of operations and in all of the relationships we enjoy with our partners.